Q: How can we calculate the amount of just-in-time inventory from the results of mid-term scheduling? A: From the results of the mid-term schedule, the system calculates the amount of demand per day for manufactures, products (parts) and purchased products. It calculates, as shown below, the amount of just-in-time production from the quantity of demand per day, delivery lead-time, safety inventory, and the number of boxed products. Set values are used for delivery lead-time, safety inventory and number of boxed products. The manufacturing plant increases or decreases the quantity of just-in-time production as determined by these numbers. In the just-in-time inventory management are jobs for which the number of just-in-time cards is hard to change. 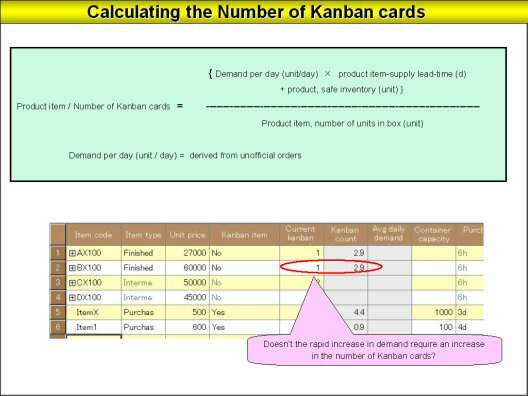 Using functions for calculating the number of just-in-time cards in mid-term scheduling allows the increase or decrease in the number of just-in-time cards to be calculated logically from the amount of demand for each product.